TLDR: 5 our of 5 for putting the reader convincingly right into the action. I has purchased this book years ago and it was been sitting on the little 'to-read' shelf under my night table. I was finally compelled to read it when Franklin's lost ships were finally found, and I enjoyed it so much it sent me down a rabbit hole of naval-expedition-reading that lasted months. I have to admit I was a little daunted at first - a significant number of critical and Goodreads reviews mention of the length of the book (over 700 pages) - some saying it featured endless pages of scurvy and nautical detail. So I decided to read the first chapter to get a feel for it - and I was instantly hooked! I did not want to put this book down, and certainly never expected to finish it in a mere two weeks. Wow! It has everything I want in a historical novel, and a dash of the mystical as well. 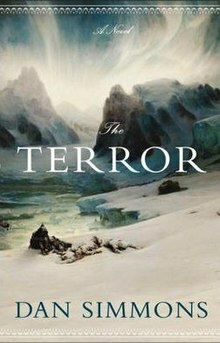 The Terror follows the crew of the Erebus and the Terror, the two ships of the Franklin Expedition for about a year, from November 1847 when they're about to enter their third and final arctic winter locked in the arctic ice, to their ultimate demise in late 1848. Although it has a supernatural element in the form of a massive, shape-shifting polar bear spirit which stalks and attacks the crew, this book remains at heart an environmental horror novel. It looks closely at the effects of living beyond one's means, and weighs in on the question of whether one is willing to set aside one's morality for the sake of necessity. Toward the end, when the crew makes a desperate trek across the ice, and the novel takes a lord-of-the-flies like turn as it morbidly follows the last hours of several of the major characters. By this time the crew is enduring extreme hardship as it labours to transport supplies and whaleboats across the uneven ice, half of the men suffering extreme scurvy and the other half missing appendages. It all ends with a full reversal of the point of view, though, and a redemption of sorts. All is not lost, thought it might have seemed like it. Although the most common criticisms of the book are "too long" and "too detailed", I found neither of these to be justified. My own worst criticism is that at times, the author intrudes just a little too much and tries to get cute. For example, one of the characters (only introduced in the middle of the novel) just happens to know both Charles Darwin and Charles Babbage, for example. I found this passage, and a few others, to be a little too cute. But this is a fairly minor complaint, and at other times, he pulls this off rather well, such as when the captains of the two ships agree to let the men host a masked Carnivale on the ice one winter night in order to lift spirits. As the scene unfolds, it becomes obvious that they've recreated the climactic scene from Edgar Allen Poe's Masque of the Red Death, though the tale is never specifically mentioned, and even the author only hints at it. I found that to be quite surreal - but then their entire existence on the ice was quite surreal, what with the perpetual night, the aurora, freezing temperatures, extreme landscape of seracs, crevasses, and pressure ridges, and the sounds - the creaks, cracks, retorts, and the howling of the wind. Simmons brings all this alive wonderfully. "The men all look the same out here on watch in the dark, since they're all issued the same cold-weather slops: layers of flannel and wool covered with a heavy waterproof greatcoat, bulbous mittens protruding from voluminous sleeves, their Welsh wigs - heavy watch caps with floppy ears - pulled tight, often with long comforters - scarves - wrapped around their heads until only the tips of their frostbitten noses are visible. But each man layers or wears his cold weather slops slightly differently - adding a comforter from home, perhaps, or an extra Welsh wig tugged down over the first, or perhaps colorful gloves lovingly knit by a mother or wife or sweetheart poking out from under the the Royal Navy outer mittens - and Crozier has learned to tell all fifty-nine of his surviving officers and men apart, even at a distance outside and in the dark." "The appointed port lookout for this watch [is] midshipman Tommy Evans - Crozier identifies the youngest man on board by the absurd green stocking cap, obviously made by the boy's mother, that Evans always pulls down over his Welsh wig..."
"There was no way that I could save him - I knew from earlier inspection that any Attempt to Remove the musket ball would have caused instant death, and I could not stem the internal Bleeding from Within the Lung - but I did my best, having the Esquimaux carried to a part of the Sick Bay which Surgeon Stanley and I have set up as a surgery. For Half an Hour yesterday after my return to the Ship, Stanley and I probed the wound front and back with our Cruelest Instruments and Cut with Energy until we found the location of the Ball in his Spine, and generally confirmed our prognosis of Instant Death." As you can see, the tone of the novel is not all dour - there is a fair amount of subtle humour and a dash of sexiness, and one does feel for the characters in the novel. The writing is very accomplished, and Simmons puts you right into those ice-locked ships, and then later out on the ice itself, slogging to drag heavy sledges over 40' pressure ridges. I felt like I was part of it all. This is definitely one of my favourite books of the past few years. 5 out of 5.